The new movie "Noah," director Darren Aronofsky's $130 million epic retelling of the story of Noah's Ark and the Great Flood, carries this advisory: "While artistic license has been taken, we believe that this film is true to the essence, values and integrity of a story that is a cornerstone of faith for millions of people worldwide." "Noah" has been banned in some Middle Eastern countries, and attacked by some Christian critics for taking liberties with scripture. Aronofksy told the New Yorker that "Noah" is "the least biblical biblical film ever made," hardly the kind of comment to calm the faithful. Fair disclaimer, but it's likely not one that will reach all filmgoers who see "Noah" with the expectation that the Aronofsky's version will closely mirror the biblical series of events. For a little scriptural background and film fact-checking, Steven D. Greydanus, a film critic for the National Catholic Register and his own website, Decent Films, and a Bible student at the Archdiocese of Newark viewed the film before its release. The experts' general verdict: there's a lot that closely mimics the epic story, but some liberties are taken. Warning: Spoilers for the film obviously follow. Is the word God missing from the film as some critics have charged? No, says Greydanus. "For the most part, God is referred to in the film as 'the Creator' and this is a creative choice that I think does a lot for the film. It helps to defamiliarize the language somewhat, it makes the figure of God a little more mysterious to us." But His name is clearly spoken when Ham, second son of Noah, says to Tubal-cain: "My father says there can be no king. The Creator is God." So who is this Tubal-cain? Tubal-cain, introduced in the Book of Genesis, is a descendant of Adam and Eve's son Cain. He doesn't actually cross paths with Noah in the Bible but, as Greydanus explains, "the film needs someone to represent the evil of mankind that is responsible for God's judgment." And what's with those giant rock creatures on Noah's ship-building crew? That one is a little tricky. According to Greydanus, the giant Watchers of the film are derived from the Nephilim of the Book of Genesis, thought of as human-angel hybrids by some scholars, and the Watchers of the Book of Enoch in the Torah. "In Aronofsky's version, the angels crash-land on Earth and, because of their disobedience to God, are punished by having their bodies of light merged with the rock," Greydanus says. "So The Watchers of the Book of Enoch become the Nephilim in Aronofsky's telling." Isn't Noah hundreds of years old? Why does Russell Crowe look so young? Yes, Noah is 500 when he has his first child, 600 at the time of the flood, and lives to the ripe old age of 950. Aronofsky has a sound explanation: "When he has those kids, he is at about five-ninths or 50 percent of his lifespan. So at about this time he should be middle-aged." How about his temperament? Aren't the prophets supposed to be a little nicer? 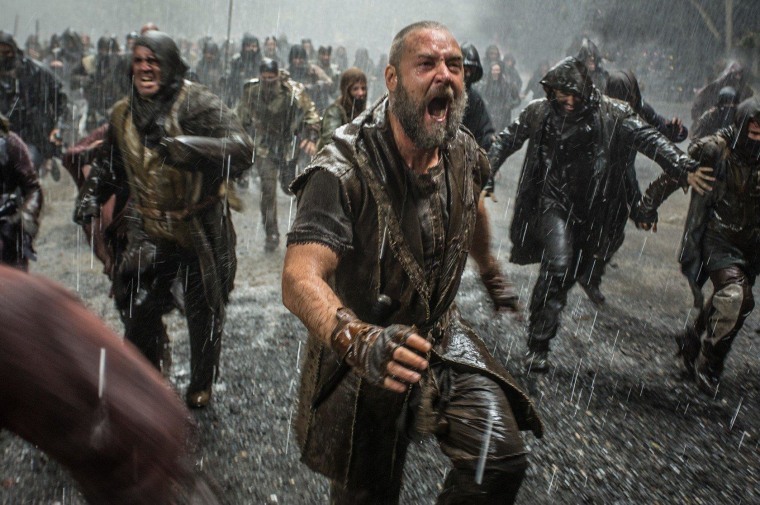 The interpretation comes from Aronofsky and Crowe, but, "the Bible doesn't give us insight into Noah's disposition or personality," Greydanus reminds us. "All we know is that he was a righteous man who obeyed God's orders. As a Catholic, I'm very aware that many saints weren't cuddly." How much of what we think of as Noah's story is based on concepts that aren't actually in the Bible? More than you might think. Greydanus says that the story has been both streamlined and elaborated upon in popular retellings. "We repeat the 40 days (of rain) but omit the 150 days (until the waters receded) that are also mentioned. We tell of the animals coming two by two but leave out that there are seven of some species so that Noah will have something to sacrifice." And as far as additions go: "We elaborate it with things like Noah preaching to the people and them mocking and rejecting his preaching, which are not in the story." What's with that floating brick of an Ark? "We picture the Ark as a traditional vessel with a curved keel and a curved hull when in reality the Bible simply describes a rectangular prism," Greydanus points out. Aronofsky in fact built his ship to the actual dimensions specified by the Bible on a New York soundstage, according to Variety film critic Scott Foundas. Is Aronofsky respectful of the text of the Bible and the beliefs of Christians? Yes, according to Greydanus. "I think Aronofsky respects the text and takes it seriously as an important cornerstone of world literature and moral reflection. Some of his dramatic additions to the story do stretch the text to the breaking point. That may be too much for many Christians but I think we need to distinguish between not making a movie that all Christians would necessarily would want to see and being disrespectful of the text." What can secular audiences can take away from this story? "For me, I would hope the main takeaway would be that the Bible is worth taking seriously," Greydanus says. "Even if you don't take it seriously as scripture."